As you may recall, my recent review of Conan The Barbarian #15: The Woman On The Wall, by the great Brian Wood, was not exactly stellar. Being a huge fan of both Mr. Wood, and Conan, I honestly don’t think I could have been more disappointed in his adaptation of the Robert E. Howard classic. 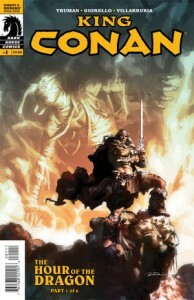 So, here I am again, faced with reviewing one of my favorite creators, Timothy Truman, taking on Conan. Admittedly, I was apprehensive. The prospect of being disappointed once again by one of my favorite comic creators not delivering the goods was nearly enough to make me skip it. Despite my concern, however, I began flipping through the pages, and I’m happy to say that after reading King Conan: Hour Of The Dragon #1, I found myself most pleased. It’s clear that Truman, along with illustrator Tomás Giorello and colorist José Villarrubia, have cultivated a true sense of the Conan epic from the very first pages, and by the last page, boy do they deliver! This is classic Conan pure and simple. Within these pages you will not find an emaciated, love-starved rogue, but the classic hulking barbarian champion of the Hyborian Age. Even as an aging King, they treat Conan not as a tired old man, but as a seasoned warrior, who, even when draped in the livery of royalty, is still quick and bold with a sword. Hard, like he oughta’ be! The strength of Truman’s fast-paced plotting remains true to the original, and is made all the more vivid by the completely immersive and stunning illustrative work of Giorello and Villarrubia. Every panel is finely crafted and completely engaging, peppered with dynamic splashes that are wrought with a dazzling display of light, shadow, and motion. Characters simply leap off the page at the reader with power and emotion. Not a page is turned that the eyes are not treated to a visual feast. This is a return to the Conan adventures of old. Epic in scope, filled with sweeping landscapes, gilded kingdoms, conquering hordes, beguiled power hungry priests, and of course (what no Conan tale worth its salt can do without) a mad sorcerer, raised from the dead by black magic, intent on usurping a bit of power himself. The only thing standing in his way—Conan. This entry was posted in Columns and tagged Brian Wood, hour of the dragon, jose villarrubia, king conan, Robert E. Howard, the woman on the wall, timothy truman, tomas giorello. Bookmark the permalink. Follow any comments here with the RSS feed for this post. Post a comment or leave a trackback: Trackback URL.